Our first stop was at the Paddy Ranges Wildflower Reserve No 2 on the western edge of Maryborough. This was once the best wildflower area in the district but the ravages of fire, drought and grazing by wallabies have lessened the spectacle. Careful observation was necessary because there were few plants flowering in abundance but we found a large variety of plants in bud and flower. Long-leaf Box was regrowing with grey-green foliage. The two most obvious plants were the dainty Fairy Wax and Common Fringe-myrtle with the lobes of the red calyx ending in fine bristles. Two peas found in flower were Showy Parrot-pea and Narrow-leaf Bitter-pea with colourful triangular seedpods. 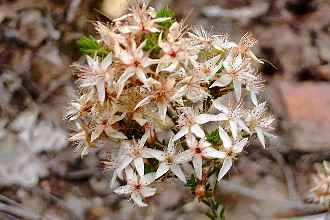 We found plants of Downy Grevillea, some with white flowers, some with yellow flowers and others with red flowers. The Sweet Bursaria were a small-leaved form. Splashes of yellow were added by Grey Everlasting in bud, Shiny Everlasting and Tangled Guinea-flower. Hedge Wattle had finished flowering. Slender Rice-flower was spread through the area. Small plants found included Chocolate Lily, Twining Fringe-lily, Wiry buttons, Pink Bells, Black-anther Flax-lily, Yam Daisy Microseris sp3, Many-flowered Matt-rush and Blue Pincushion. Leaf litter. 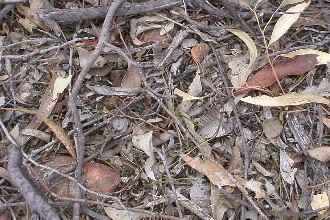 Many plants have shed leaves in the dry conditions. 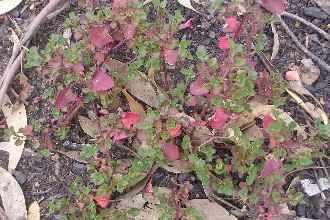 Saloop is a prostrate saltbush. 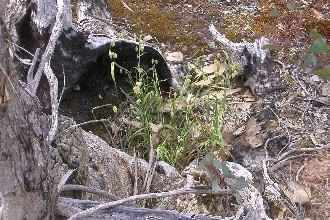 Many of the bushland weeds have been affected by the drought. Shell Grass is growing strongly only in depressions where there has been added moisture.